Send back the waste that comes with old school containers and reach for something different. 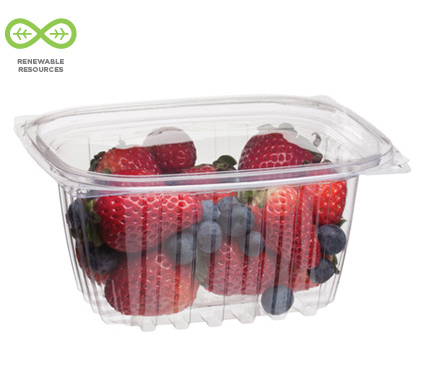 Renewable and compostable PLA is just as clear as your mom's plastic, so you've got a great option for your Grab 'n Go needs. Remember though, PLA only works for cold foods, so think recycled content if the goods are hot! Traditional plastics are made from petroleum, the world's most valuable, non-renewable resource. 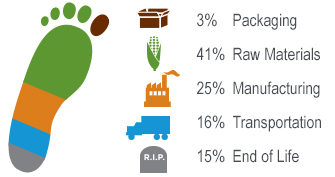 Polylactic acid (PLA) or "corn plastic" is made from annually renewable resources, not oil. Our PLA products are compostable in commercial compost facilities, but unfortunately not in your home compost. These plant-based alternatives to oil-based plastic will make your food look great and your business eco-friendly. Top Dimensions: 5-7/8 in. x 4-7/8 in. Bottom Dimensions: 4-7/8 in. x 3 in. These stackable cold food containers work great for salads. Top Dimensions: 5-7/8 in. x 4-7/8in. Bottom Dimensions: 4 in. x 2 in. Stock up your deli or caf‚ with these rectangular deli containers. Bottom Dimensions: 4 in. x 3 in. Got big portions? These large renewable and compostable containers have big environmental benefits. Top Dimensions: 7-1/2 in. x 6-1/2 in. Bottom Dimensions: 5-1/2 in. x 4 in. These clear rectangular deli containers are renewable and compostable. Bottom Dimensions: 5 in. x 4 in. These rectangular deli containers are a greener alternative to plastic and they'll make your food look great. Top Dimensions: 8 in. x 6 in. Bottom Dimensions: 7 in. x 5 in. These big cold food containers serve up large portions in an eco-friendly way. Top Dimensions: 9 in. x 7-1/4 in. Bottom Dimensions: 7-3/4 in. x 6 in.